eCommerce site for Michael Antonio Footwear in 2011. Michael Antonio Footwear had made a name for themselves over the years being the shoes for the party girl. Marketed chiefly to late teen girls and twenty-something women seeking a disposable pair for a night on the club circuit, Michael Antonio wanted to move upmarket into a more career focused and practical offering for customers seeking something a little more focused. MAF knew their customer would always be the party scene, it was important not to lose sight of that. Just as important to the folks at MAF was the idea of pushing an image not just a shoe. The product has a youthful, fickle audience and the site needed to push Michael Antonio into the forefront of digital style. Michael Antonio also had three somewhat confusing product lines, they wanted the site to help clarify where the lines were between them. 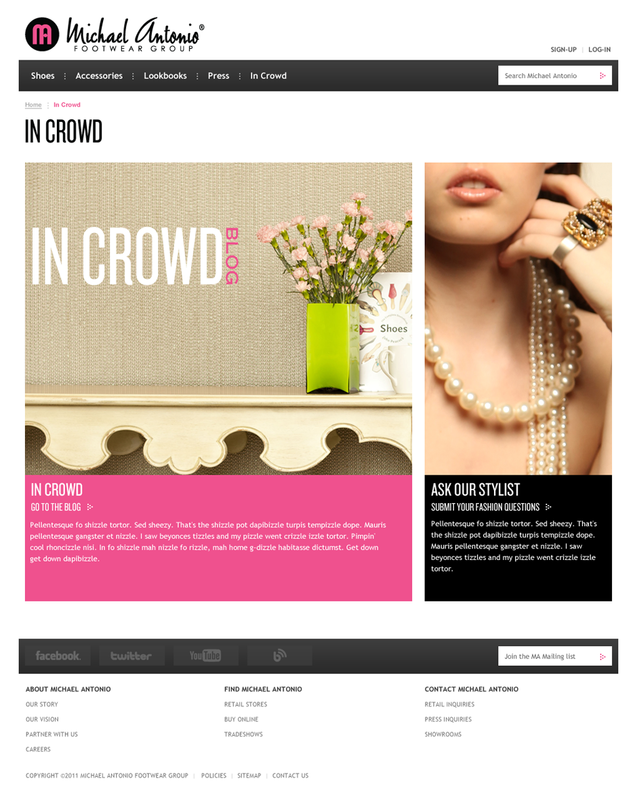 The site featured a unique tie-in with a social blogging strategy, as well as fulfillment through key partners like Zappos and Piperlime.